« Shouldn’t we be getting tax credits? 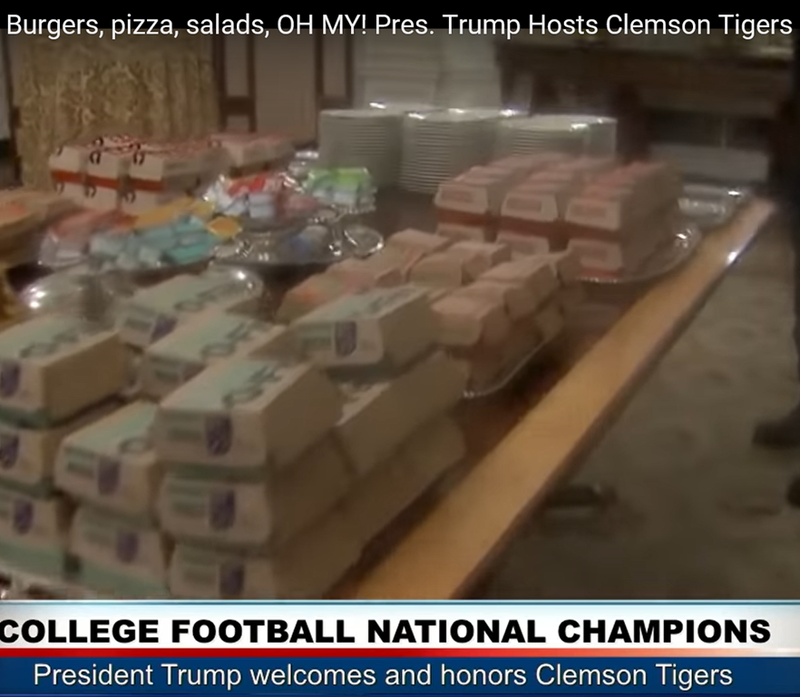 Yesterday, President Trump welcomed the National Champion Clemson Tigers to the White House. In his remarks, Trump said it was his favorite food … and that it was make-shift because some of the WH staff was on furlough …that he was personally paying for the spread … and that these were his favorite foods. Some may say “not Presidential” … but, sure seems consistent with the guy’s personality, right? P.S. to the Philadelphia Eagles: All of this could have been your’s last year. Eat your hearts out. This entry was posted on January 15, 2019 at 6:59 am and is filed under authenticity, Trump, President Donald J., Warren, Elizabeth. You can follow any responses to this entry through the RSS 2.0 feed. You can leave a response, or trackback from your own site.